Fish the calm, blue waters off of the Kona coast with one of Hawaii's most experienced captains and crews. 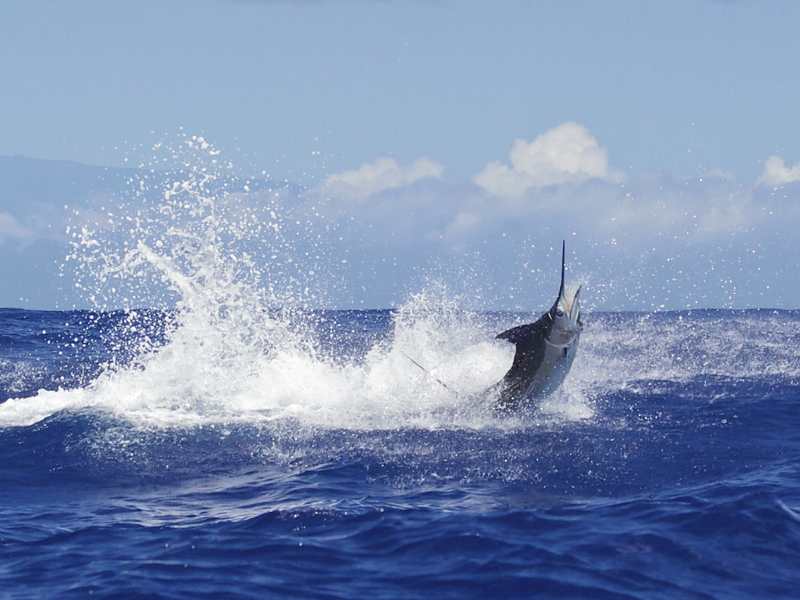 This 4-hour Kona Fishing Charter includes everything needed to catch blue marlin and other pelagic species that inhabit the waters just off of the Kona coast. We include all the rods, reels tackle, bait, ice and expertise and the action waits just a short 5-10 minute run out of the harbor from our slip. While we primarily target Blue Marlin, the same gear and tactics produce results for other species such as Ahi Tuna (Yellowfin Tuna), Ono (Wahoo), Mahi Mahi (Dorado), Striped Marlin, and Shortbilled Spearfish. These species are found year round here in Kona which makes this such a popular and productive fishery. We have been fishing the waters off of the Kona coast for over 50 years, so you can be assured we have the knowledge and experience to make your fishing charter a success. - Valid for one (1) 1/2-Day (4-hour) Kona deep sea fishing charter. - Morning or Afternoon charters available. - Offer Valid for online bookings only and must be paid in full at time of reservation. - Valid for direct bookings only. Not valid if booked through a third party. - Kona Fishing Charter is valid for one (1) to six (6) passengers OF ANY AGE. - A 100% refund will be applied for cancellations made 15 days or more from the date of departure. - Refunds made less than 15 days of departure will be assessed a $175 cancellation fee. - Changes to charter date and times may be made within 15 days of departure on a space available basis. - Cancellation due to weather deemed by the Captain to be unsafe will be refunded or rebooked on a space available basis (but it rarely happens here in Kona). - Not valid toward ANY previously booked charter. - Charters depart Kona, Honokohau Harbor, Slip B-4. - All tackle and bait provided. You must bring your own food and drinks unless purchased online at time of booking. - Alcoholic beverages are permitted for those of legal drinking age. - No fishing license is required. - Not valid for use in any tournament event. - Not valid in conjunction with Kamaaina discount or any other discount offer. - Voucher or Gift Cards purchased through our website may be used for the purchase of this charter. - Hawaii Sales Tax of 4.166% will be charged in addition to the charter fee. - State of Hawaii Harbor Tax of 3% will be charged in addition to the charter fee. - An order processing fee of 3% will be charged in addition to the charter fee. ***Gratuities are not included in the price of the charter and our crew always appreciates the recognition of a job well done...fish or no fish.